Well, it was quite an evening. Seldom have so many Champagne-loving diners been besieged by so many great wines. Magnums to the right of us, bottles to the left of us. One moment a grower would be enjoying Warm chestnut and oyster broth with wild Scottish seaweeds and Mottra Osetra caviar, the next he’d be on his feet with a magnum of his 1982, or his 1988, or even his 1959, offering it to all and sundry. In the background, Midnight Swing played jazz and swing all night. Peter Liem, as impeccably uncreased and relaxed at the end of the evening as he had been for his seminar that morning, greeted old friends and new. In the mirrored rococo of The Savoy’s River Room, some 150 people were talking about Champagne. It had been quite a day. Two days, in fact. The occasion was La Fête du Champagne, a celebration of the wines of the region organized by Liem and Daniel Johnnes. New Yorkers are familiar with this event: it’s been held each year in their city since 2014. This was the first time it has moved elsewhere, and so London, another great Champagne-loving city, had the pleasure of hosting 27 producers and a great many more Champagne lovers from San Francisco, Portland, New York, Peru, Hong Kong, Japan – and those were only the ones I managed to talk to. But if those guests and producers thought that part of the Strand was closed to vehicles for their benefit, or that the unusual numbers of police at both entrances to The Savoy Hotel were to protect them, let me disabuse them: Benjamin Netanyahu was a fellow guest at the hotel. Funnily enough, he didn’t join us. On Friday night there was a dinner at 108 Garage, a newish, industrial-chic, restaurant in west London’s Golborne Road. The food here is original, inventive and perfectly judged; Chris Denney’s cooking is deft and assured. The Champagne, on this occasion, was Dom Pérignon: precision meets precision. Chef de cave Richard Geoffroy came over to introduce the 2009, 2005, 2003, P2 2000, Rosé 2005, P3 1990, P3 1985 and P3 1973, and I wish I’d been there. Saturday, though, was the main day. There were two seminars in the morning: one on Dom Ruinart Rosé by Dom Ruinart chef de cave, the ever-informative and genial Frédéric Panaïotis. He presented the non-vintage, the NV in magnum, the 2002, 1998 in magnum, 1990 in magnum and 1988, and talked of the Champagne soils and climates that produce great rosé. The other was by Peter Liem, courtesy of The World of Fine Wine, which was a sponsor of the Fête, and the subject was The Terroirs of the Côte des Blancs. I have seldom heard such a clear exposition: Liem is a most sympathetic speaker, unhampered by ego but with enormous depth of knowledge. For example, he draws a notional line at Avize to mark the boundary between the north of the Côte des Blancs and the south. The north, he says, is about body, minerality and darker fruit; the chalkier south, including Le Mesnil, Oger and Vertus, is saltier and racier. He talked of the pencil-lead character of Avize Chardonnay, typified by Larmandier-Bernier’s Les Chemins d’Avize 2011, and the stone-fruit of Oger and the apples, pears and green fruit of Le Mesnil. Pol Roger Blanc de Blancs 2009, from Avize, Oger and Le Mesnil, from a hot year, was very yellow stone-fruits. Pierre Gimonnet Special Club 2010, based on centenarian vines in Cramant with some Premier Cru Cuis, showed the dark minerality of the north. AR Lenoble Cuvée Gentilhomme 2009, from two parcels in Chouilly, has all the body and richness of Chouilly (Liem differentiates between the two sides of Chouilly, the part closer to Epernay and the better part closer to Cramant.) JL Vergnon OG 2011 comes from Oger (the clue is in the name, but you have to say “OG” in French, not in English) and has all the ripeness and steel of the south. Liem also pointed out that in the 19th century “people only cared about Avize and Cramant, and not about Le Mesnil at all.” It was the eruption of Salon on to the scene from the 1920s that changed that. Talking of salons… After Liem’s x-ray of chalk there was the Grand Tasting in the River Room: 27 producers with four wines each, with the most agreeable little snacks on offer to tide one through lunch. A bit of smoked eel here, an oyster there; a smidgen of caviar, an elegant slice of porc en croute… and brilliant wines, from a list heavy on growers and light on big houses. There were the spectacular wines of Pierre Péters, Jérôme Prevost’s La Closerie, Gosset and Jacquesson, Benoît Lahaye and Jacques Lassaigne, Eric Rodez, Pierre Gerbais, Michel Gonet, Tarlant and Vilmart and others. 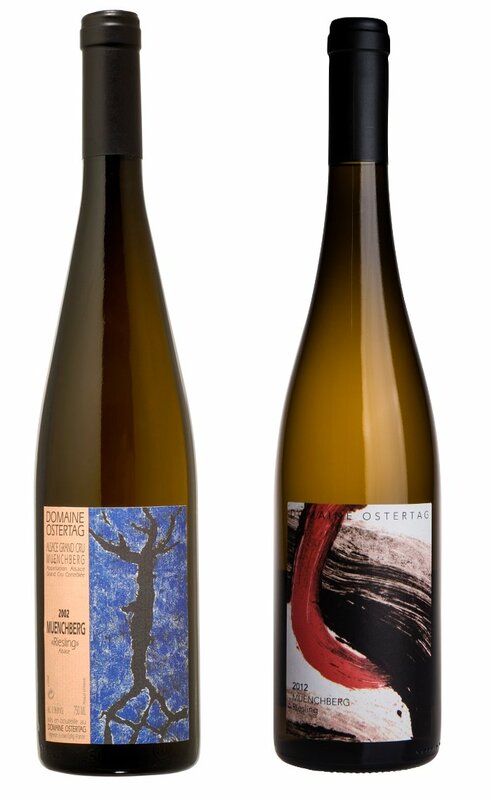 Everything there had character and individuality, and all the wines were presented by the owner and/or the winemaker. Were people enjoying themselves? Yes! Deborah and David had come from San Francisco and were going on to Paris – the trip was a birthday present to David. 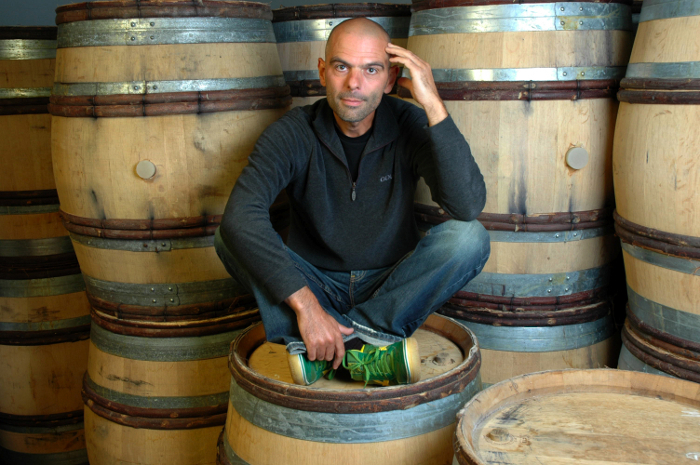 They’ve been to Daniel Johnnes’ La Paulée in San Francisco and also to the big Carrousel du Louvre tasting in Paris. (Don’t go on the Saturday, they warn.) A and B from Portland, Oregon (I knew I should have checked their names) had also come over specially and could probably be classified as fans of Peter Liem. Jorge, a sommelier and Pisco specialist from Peru, was having to skip the tasting because he had to swot for his WSET exams, but he looked happy about what he’d tasted. The room was full of people who not just loved Champagne but knew it well and understood its nuances: this was a gathering of serious tasters. All the growers were there at dinner, and a great many guests – there were perhaps 150 of us in all. Cooking for us were Arnaud Lallement of L’Assiette Champenoise; James Knappett of Kitchen Table; Jonny Lake of The Fat Duck; Isaac McHale of The Clove Club and Holger Jackisch of The Savoy. There were sommeliers of the calibre of Isa Bal of The Fat Duck, Dawn Davies MW of Speciality Drinks and Michael Sager of Sager + Wilde – 40 of them in all. The food was served with military precision – the waiting staff had apparently been thoroughly drilled in how to serve each course – and they arrived at each table like a chorus line. The first course was Cornish line-caught mackerel, gomashio, teriyaki, palm sugar, fig-leaf oil and rhubarb, produced by James Knappett, and with wonderful transparent sharp and sweet flavors. It didn’t, however, entirely flatter any of the Champagnes that came my way – a little too linear and sharp, perhaps. What were those Champagnes? My notes are scattered and brief. There was ripe, pithy Drappier Grande Sendrée 2008, a wine with an entrenched spelling mistake on its label, according to my neighbor, Hugo Drappier. 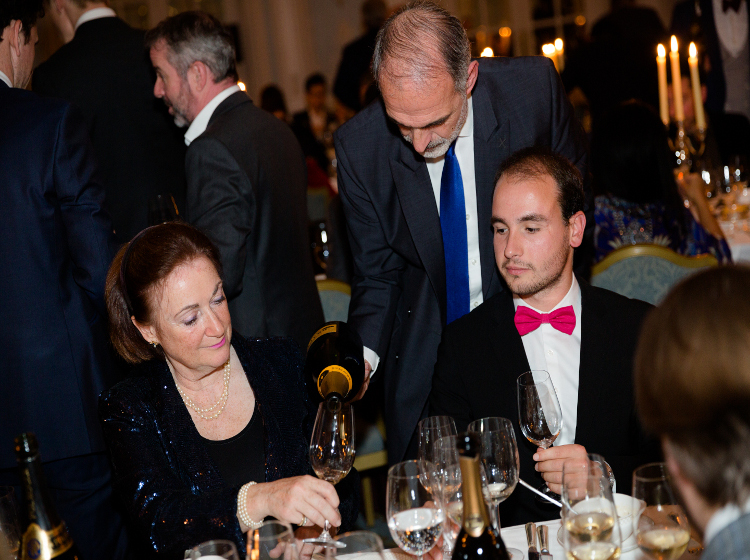 Hugo is next in line to take over the winemaking from his father Michel – who was also there, occasionally wandering over to give his son a taste of something special, ‘for his education’. Of Hugo’s two siblings, his sister is already working in the company, and his younger brother plans to do so – his interests are in horses and nature. He’s determined that Drappier should use horses in the vineyard, but for their number of hectares they will need no fewer than eight. We shall see. There was also Pol Roger 1999 from magnum, probably disgorged in 2007, and wonderfully winey. There was ripe, rich Pascal Doquet Blanc de Blancs, and Charles Heidsieck 1985, and Gosset 15 Years Old bottled 1999; but in what order these arrived I cannot tell you; pouring was informal and rapid. Each guest had three glasses, and there was a great deal of dispatching one sample to make way for the next; wine followed wine with generosity and abundance. But I can tell you one match which stood out. Gimonnet 1996, disgorged early 2017, was a successful wine in a difficult year, and was brilliant with the Warm chestnut and oyster broth dish mentioned at the beginning. This was Isaac McHale’s dish; after it came Arnaud Lallement’s Saint Pierre with mini poireaux and Coteaux Champenois sauce, a classically perfect match for Champagne, with its creamy, fresh flavors. Then was Jonny Lake’s Coq au Champagne: Cour d’Armoise chicken, three-cornered garlic and mushroom, another dish made for Champagne, and – for The Fat Duck – surprisingly conventional in flavor. The Savoy chose the British artisan cheeses that followed, and after that came petits fours and Praline en surprise, also from The Savoy. The wines kept coming. Krug Grande Cuvée disgorged in the first quarter of 2014; Eric Rodez’s blend of 1998, ’96, ’95, ’93, ’92 and ’90, all pear- and apple-skins; Dom Ruinart Rosé 2002, creamy and winey; Jacquesson’s precise, fresh 2000; Charles Heidsieck 2005, citrus and smoky; Krug 1988; Philipponnat Clos des Goisses 1990; Charles Heidsieck 1937, maderized but intact; Drappier Carte d’Or 1995; AR Lenoble 1996; Roederer 1937 Demi-Sec; Charles Heidsieck 1959. As you might infer, as the wines came thicker and faster, so the notes got thinner and thinner. Everybody had different wines, depending on who was pouring what near them. (Where the bottles appeared from I have no idea; they just appeared, like so many rabbits from hats.) 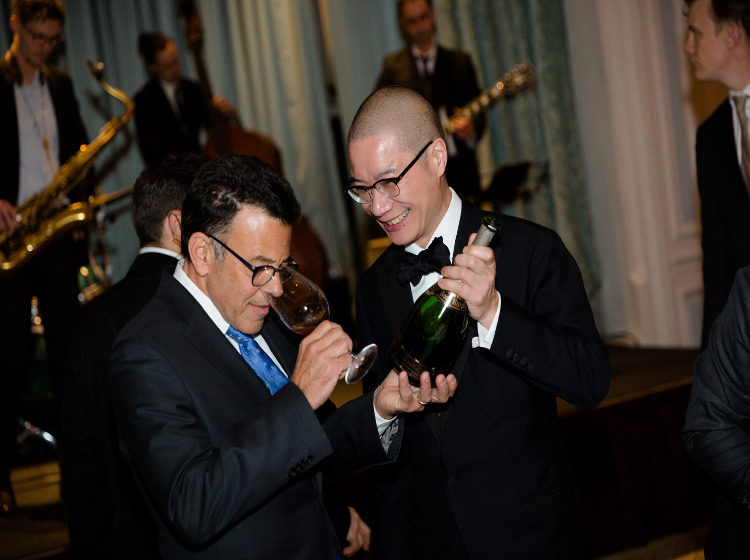 Peter Liem relished a flight of 1954s, and Clos du Mesnil 1985. (He was the man to sit near, clearly.) Even for him, it was quite an evening.